If you live in Grosse Ile, Michigan and are in the market for roof repairs, roofing maintenance, or roof installation, and are in search of a customer top-rated roofing contractor, you need to call Downriver Roofers. For more than 20 years, our highly experienced roofing professionals have been providing the highest quality GAF and CertainTeed materials and workmanship to customers throughout the Downriver, MI area. 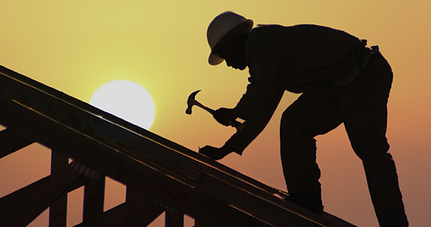 We are recognized for delivering the most affordable, exceptional roofs you can find anywhere. If you are having issues with loose and missing shingles, snow or ice on your roof, poor roof ventilation, holes, leaks, wear and tear, or roof ice dams, we can solve your problems. We are the experts at performing new roof installations, roofing repairs, roofing maintenance, roofing inspections, protective roof coatings, tear-offs, re-roofs, and roof ventilation and upgrades. Most other roofing companies won’t offer you the one-on-one, personalized attention we do at Downriver Roofers. Whether you own a commercial or residential property, it makes no difference – you still need to protect your greatest assets, and that includes your roof. Our comprehensively trained roofing team will effectively perform an interior and exterior roof inspection on your Grosse Ile, Michigan property, providing the final results to you so you can make the best decision for your budget and lifestyle. It could be some basic roof maintenance or repairs are needed, or a new roof may be in order. In either case, we will offer you options, options, and more options, so you won’t have to worry about a thing. Did your home weather a recent snowstorm, hailstorm, or tornado? Are you worried about roofing damage? This is a common fear of Michigan homeowners because they know their roof provides a barrier to rain, bugs, air, and moisture. What’s more, a compromised roof can lead to numerous structural problems, sometimes rendering the interior of the home unlivable until the repairs are performed. We don’t want you to be in this position because your home should be comfortable and well-protected from the elements. If your home has a damaged roof, be sure to immediately report the claim to your insurance company, secure several roofing estimates, wait for an inspection of the damage by your insurance adjuster, and finally agree upon a reasonable price for the job with a roofing contractor. Doing anything less will not adequately protect your interests as the property owner, especially preventing future damage to your home. Honestly, it’s hard to ascend a ladder, especially in the dead heat of summer or when there are sub-zero temperatures, and then try to pry those old asphalt shingles and lumber from your home’s timber frame. Before you hire a Grosse Ile roofing contractor, you should understand the industry. People who work for roofing contractors are usually paid low hourly wages, which means they may not have the buy-in with their company. These workers may not perform their best work to ensure that your home or another consumer’s home will be well-insulated from water damage. Low-earning workers also tend to move frequently from job to job. To get your roof fixed, start by talking to your neighbors with new roofs and see which contractors they used in recent years. It’s important to consider multiple roofing companies and to research the quality of work they performed in the past for local homeowners just like you. If you find that a prospective roofing contractor has never built new roofs or completed repairs on homes in your part of the Wolverine State, it’s best to choose another company. When a contractor lacks experience in your region, it’s impossible to inspect the quality of their work. When you research Grosse Ile roofing contractors, bear in mind they have their preferred type of shingle. They may have arrangements with one or more shingle makers to perform work that will be covered under a manufacturer’s warranty. If you are going to choose a specific shingle (preferably the 50-year kind because it has the longest guarantee), then please ensure that your preferred contractor is certified to perform the work by the shingle manufacturer. Be sure to compare the costs of different kinds of replacement roofs, including asphalt shingle, wood shingle, tile, and metal. We’re concerned that your roof has been damaged or completely destroyed by a recent storm. You are now one of a long list of affected homeowners who must wait until a roofing company has time to schedule a roof repair or replacement. However, local roofing contractors may have so much work to do that they will be booked for months. They will work from sunrise to sunset seven days a week, stop for inclement weather every so often, and take more than a year to catch up on their roofing jobs. This is not a company that will be able to fit in your home’s roofing needs. Other companies with a national reputation and licensure in multiple states can also come in and assist homeowners, providing additional roofing support to storm-impacted areas. We help homeowners with specific roofing needs in Grosse Ile Michigan. We’ve performed these services for years to remedy property damage that our customers could not prevent. For more details on getting your Michigan roof fixed or replaced, please contact us today.